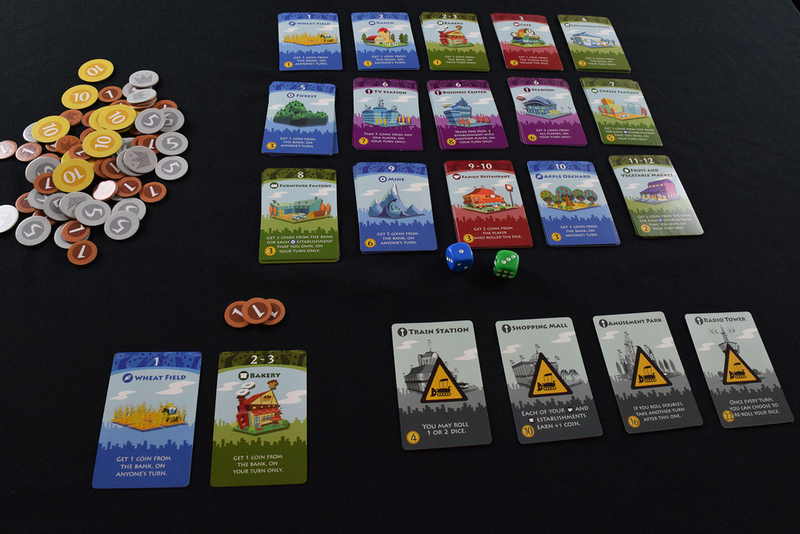 The adorable Machi Koro deserves a spot at the game table. As a city planner, you have a dream. 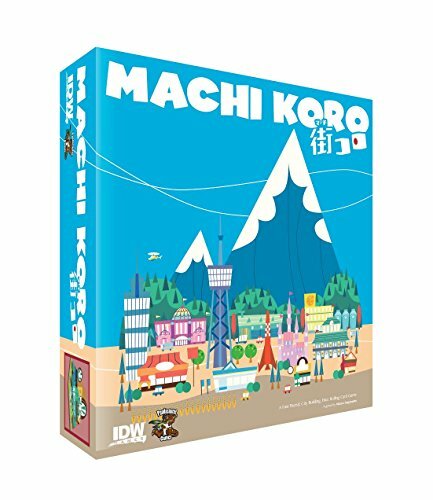 To make the sleepy town of Machi Koro into one of Japan’s largest and most amazing cities. But you’re not the only dreamer in town. Up to three others share your aspirations. Now it’s a race to see who can build Machi Koro into a metropolis. To do this, you need to purchase your fourth city landmark before anyone else. And for that, you’ll need money. Good thing there’s a marketplace where, every turn, you can buy an enhancement to your city that can earn you some dough. Money is earned by rolling one or two die and hoping the results match the activation number at the top of your card. There are four types of cards (all color coded) which dictate when a card is activated. Blue activates on anyone’s turn. Let’s say you roll a 1, it actives your Wheat Field and mine, meaning I get money on your turn. Green cards activate only on your own turn. Red activate on another player’s turn and allows you to steal money from them (ya jerk). And purple are special cards that only activate on your turn, but generally screw over other players. You roll, you (maybe) earn money, you buy one card. That’s Machi Koro. I like Dominion and Splendor, I like dice, and I like building big cities in Japan and imagining Godzilla wrecking them. Roll one or (if you’ve bought the proper city landmark) two dice. Check the result to see if anyone’s cards activate. Activate cards in this order: Red, Blue/Green, and lastly purple. Buy one card from the marketplace or develop one of your four city landmarks. The game ends as soon as someone builds their fourth landmark. Splendor with dice, more backstabbing, and faster paths to victory. You’ve built up a proper combo set of cards, get the dice roll you needed, and score a bucketful of coins. Cha-ching! Your opponent earns enough on a single turn to assure victory, but since they can only buy one landmark a turn, you are stuck watching them eat away at your hope… turn after turn, knowing you’ve lost. I love the simple art style. It fits the theme and something more realistic (a la Splendor) wouldn’t have worked. The cards and the little cardboard tokens are fine, but nothing to write home about. I’m a sucker for custom dice – and these are just two colors sixers, which is a bit of a bummer. Even a little Machi Koro symbol to represent the “1” would have been nice. Thirty seconds to grasp how to play. One playthrough to understand how to win. I believe the errata for the rules states: Drink sake anytime someone rolls a one. Not just worth it, but necessary. Expansions will beef up this one and add some extra depth. A good blend of strategy and chance. You can earn money on other people’s turns, so everyone is engaged from start to finish. Not many diverse paths to victory. You can see you’ve lost, and there’s no way to come back. Not as enjoyable with only two players. You like cute, family friendly games. Fun is a thing that you enjoy. You aren’t afraid of buying some expansions. Questions about Machi Koro? Ask in the comments. 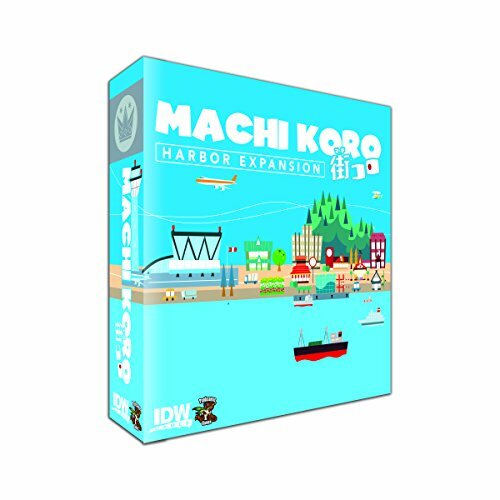 Played Machi Koro and have your own opinion? Tell us! We may feature you in the Dog and Thimble Podcast.